Students will have the opportunity to participate in the Christmas Recital, Leesburg Christmas Parade, End of the year recital (May or June) and other special events and/or local appearances. Class attendance must be favorable to participate. Scheduled practices and dress rehearsals are mandatory. Students will require costumes, which are selected by the instructors to offer the best value and appearance. Deposit and balance due dates will be required for each student, and fees must be satisfied before costumes may be released. It is imperative for all students to wear appropriate dance attire and proper shoes according to class at all times to ensure proper instruction and movement during class. This includes leotards, convertible tights, beige tap shoes and pink ballet shoes. Hair must be pulled back out of the face in a ponytail or bun. Leotards, tights and shoes will be made available for purchase at the time of registration. Leotards must be purchased from Dance Dynamix. Sometimes the interest level of children waivers after the newness of class has worn off. This is normal and should not be considered a loss of interest. Gentle encouragement is needed both in class, as well as at home. Once a child has completed the first year and participated in the recital, both parent and child may expect to experience a feeling of accomplishment and pride from their dance experience. Teams will participate in competitions and other special events throughout the year. There is an additional fee for team classes, as there will be several extra practice classes before each competition and/or event. GOOD ATTENDANCE IS A REQUIREMENT! Auditions will be announced (usually in June or July). Team members are required to receive instruction in all areas of dance. Additional costs to the student will include competition fees, additional costume costs, as well as traveling expenses. We strongly encourage dancers to study ballet throughout their training. Ballet is key in the development of technique and strength in all forms of dance. Because of the unnatural movements ballet requires, it should be taught in a way that allows the student to understand the importance of its challenges. Other traditional dance forms we teach are pointe, tap, jazz, acrobatics, lyrical, contemporary and hip hop. Our classes are scheduled according to the Lake County School Calendar. Our Holiday Schedule in accordance with Lake County School is as follows:We will be closed for Labor Day, Thanksgiving Break (unless you are on the competition team), Winter Break and Spring Break. Class Placement is at the discretion of the instructor. Students are placed in class according to their age as well as their individual development and ability. Dance Dynamix requires 30 day written notice of cancellation of classes. No food, chewing gum, candy or soft drinks allowed in the studio! Bottled water only. Parents, please be on time bringing your child to class, as well as picking them up. Regular class attendance is imperative for the student to gain full potential of his/her dance training and performance. Dance Dynamix reserves the right to dismiss any student whose conduct, attendance, attitude or payment history is unsatisfactory. Dance Dynamix is not responsible for personal injuries, accidents, or illness that occurs while student is in its care, unless proven such was a direct result of the neglegence of its laborer. Regular registration begins in August. There is a yearly registration fee of $25.00. Dates to be posted at a later time. Call for more information. 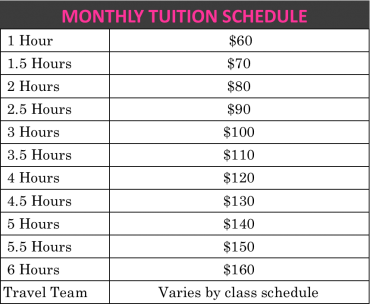 Monthly Tuition is due on the first lesson of the month, regardless of the student’s attendance. Classes begin in September and continue through June. Dance fees are the same every month regardless of the number of weeks in any given month. a $10.00 late fee will be added to payments not received by the 5th of the month. A $25.00 charge will be assessed for any returned checks. A sibling discount of $5.00 off the monthly tuition is available per sibling. A dancer since the age of three, Terri’s skills emerged from extensive training in dance arts under such greats as Jamie Pisano, choreographer and dance instructor best known for her work in the movie “Tap” with Gregory Hines. A dancer since 1990, Terri is a member of Florida Dance Masters, an educational dance teacher organization which has served the dance industry for more than a century. She is a performer, Master teacher, dance coach, adjudicator, and choreographer. Each year her Competition and Travel Teams receive top awards at national competitions and shows. Personally she continues to win national teaching and choreography awards. Terri is the owner and Instructor of Dance Dynamix. Terri has also served as a cheerleading coach and choreographer for Leesburg High School, and recently was selected as a judge for a national dance competition in Las Vegas. Ron began his professional career at the age of seventeen as an apprentice for George Bananchine’s New York City Ballet. he performed in four popular Broadway productions, including Fanny and My Fair lady, then moving on to the original Moulin Rouge in Paris where he became the first non-French citizen to have the lead solo as a Can Can dancer. Ron also spent a year as a lead dancer at Follies Bergere and the Casino de Parisl. His acclaimed stage credits include command performances for Her Majesty the Queen Mother and Princess Elizabeth II at the Palladium Theatre in London as well as for Princess Grace in Monte Carlo. Ron and his wife Joy were Adagio Ballet soloist with the New York City Opera Company in the productions of Faust and Aida. During this time the Holidays received their first exotic cat, and African Leopard named Aladdin, who helped to ignite their Cat Dancers career. Ron is a published author with autobiography, “Cat Dancer” and his biographical documentary can be seen on HBO and Cinemax. Alexander started his dance training at the age of four in DeSoto, Texas with Stacia Woodlan, Holly Belford-Davis and Lanita Moore. He attributes his core training to Jana Block Mitchell, Malana Murphy, and Michelle Sherrill, his teachers at the formerly-known Dancin’ Feet Performing Company of Lewisville, Texas where he was able to hone his skills in ballet, tap, jazz, lyrical, musical theater and then added hip hop, modern, and contemporary to his repertoire. Since then, he has worked alongside notable dancers, teachers, and choreographers such as Alexander Pelham, Debbie Allen, Todrick Hall, Christopher Huggins, William B. McClellan, Jr., and Jason Samuels-Smith. He has also performed with artists such as MC Hammer and Destiny’s Child, appeared in The Nutcracker with The Moscow Ballet and also on Barney and Friends, So You Think You Can Dance, Todrick, Wife Swap, Ridiculousness, and Dance Moms. Edwards is an alumnus of the world-renowned Booker T. Washington High School for the Performing and Visual Arts and Point Park University. He was a member of the world-renowned Dayton Contemporary Dance Company. His award-winning choreography has been showcased on the competitive stage, universities across the country, and even Cedar Point amusement park. In addition to his dance experience, Edwards is also an adjudicator for Starpower, Revolution, Leap!, Fearless, and Imagine Dance Challenge and a freelance dancer/teacher/choreographer/singer/songwriter/actor, based out of Los Angeles, attributing each experience he has encountered to God, his family, and everyone else who has supported him throughout his journey. Kaylyn has been dancing under the instruction of Terri since she was 5. She began competing at a young age all over the state and went on to win numerous overall awards. She was invited to tour Star Systems 7 City Dance Tour. At the age of 10 she auditioned and was featured in a Nickelodeon video titled “Little Kid’s Dance Party”. Kaylyn has served as a dance instructor and choreographer for the South Sumter Middle School Dance Team along with a choreographer for Leesburg High School Cheerleading. She has judged numerous dance, cheerleading and baton tryouts through TriCity. Kaylyn loves to work with children and is proud to be a part of the Dance Dynamix family. Rachel fell in love with dance when she saw her first ballet, The Nutcracker, at the age of 4. In 2005, she joined the Dance Dynamix family and never looked back! Thanks to the love and support of Ms Terri, Mr Ron and Miss KK, Rachel quickly grew into a beautiful and confident dancer. In 2007 she joined the award winning competition dance team were she continued to learn all styles of dance. She is currently attending Seminole State College where she is studying Modern/Contemporary dance as well as Communications and Design. Rachel’s passion for dance continues where it all began, teaching pre-school and beginners classes. The 500-seat Fain Theatre was originally built in 1932 as the B-movie house in Leesburg. In 1960 it went through in extensive renovation to the plans of Rufus E. Bland, and was renamed the Tropic Theatre. In 1979 it was added onto and became the Tropic Twin Theatre. It continued to show first run movies until the mid-1980’s. It then changed hands several times and was finally closed in June 2004. Terri Hicks bought the historical Tropic Theatre in 2006 and renovated it. The auditorium was stripped back to its brick walls. The floors were discovered to be red oak. There are also three dance studios. I️ have been counting the days until my daughter could take dance. We go weekly and I️ can’t get her to leave. She loves it and has formed a special bond with the instructors there, even the ones who do not directly teach her class. Looking forward to many years of dance with this studio.